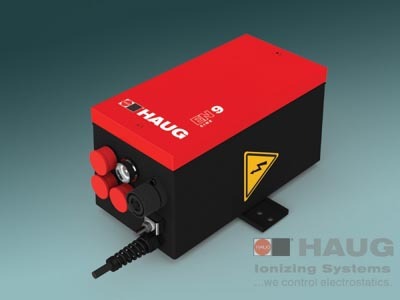 The discharging power pack EN 9 Sine supplies energy to HAUG ionizing units. A functional monitoring facility reports impermissible operating states in the ionizing system such as short circuit and spark formation or thermal overload. The EN 9 Sine can be pulsed and supplies a monitoring signal of the output high voltage. The EN 9 Sine provides a high voltage of 7–8 kV AC and supplies HAUG ionizing units with a connected length of 18 m max. (incl. HV cable). The signalling socket K1 supplies a linear monitoring signal of the output high voltage for reporting and control purposes. At an output high voltage of 7 kV AC, for example, the monitoring signal has a voltage level of 7 VDC. In addition, the output high voltage of the EN 9 Sine can be pulsed via signalling socket K1. This means that the ionization process of the connected ionizing units can be switched on and off from a control desk or machine control unit. This allows the ionizing system to be operated very efficiently with regard to the energy input. The function monitoring facility of the EN 9 Sine permanently monitors the output high voltage in the components of the ionization system – from the discharging power pack via the high voltage lines through to the connected ionizing units. In the event of a short circuit or spark formation in the ionizing system, e.g. due to faulty insulation, the EN 9 Sine will switch off the output high voltage and report the fault via a signalling lamp. The monitoring signal of the output high voltage drops to 0 V. Thermal overloading of the discharging power pack also results in the output high voltage being switched off. The switching off of the output high voltage protects the product, the ionizing system and machine components from consequential damage. The discharging power pack EN 9 Sine has been manufactured to conform to protection type IP 54.